DETROIT -- With the first Italian-made Jeep, the Renegade subcompact SUV, rolling into U.S. dealerships this month, brand head Mike Manley says global expansion will continue this year, with new plants in Brazil and China. 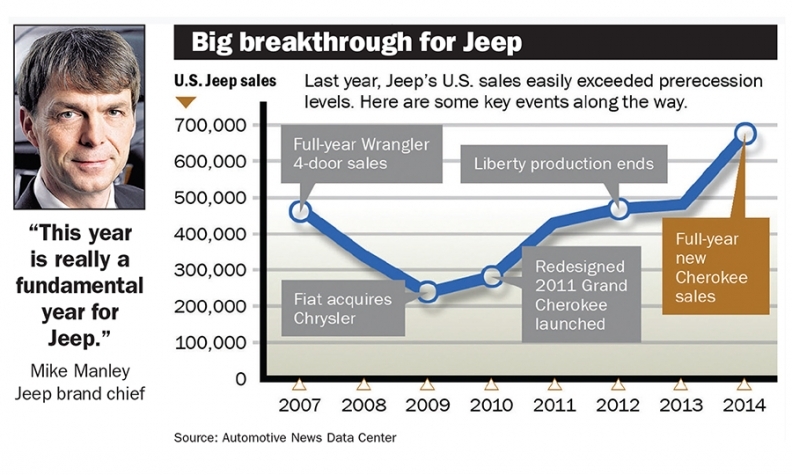 "This year is really a fundamental year for Jeep. It's the year where we really begin the full globalization of our manufacturing footprint," Manley said this month at a media event here. Jeep hit an important milestone in 2014, manufacturing and selling more than 1 million Jeeps worldwide for the first time. The brand sold a record 692,348 Jeeps in the United States last year. This year, Manley said, sales through mid-March were up about 20 percent over last year. In April, Fiat Chrysler Automobiles will open an assembly plant and supplier park in the state of Pernambuco, Brazil. The $1.27 billion plant eventually will produce up to 250,000 vehicles per year -- starting with the 2015 Jeep Renegade -- for distribution in Latin America. At the end of 2015, FCA will return to China as a local manufacturer for the first time in a decade when it opens a joint operating venture with Guangzhou Automobile Industry Group. The plant will build local versions of the Jeep Cherokee and Renegade for sale in China and elsewhere in Asia. FCA's plant in Melfi, Italy, began turning out Renegades last year. They began arriving at U.S. dealerships in the middle of March. "I'd like to see [dealers fully stocked with Renegades] by the middle or toward the end of April," Manley said. "I'm confident that there's a lot of pent-up demand to see the vehicle and drive the vehicle."